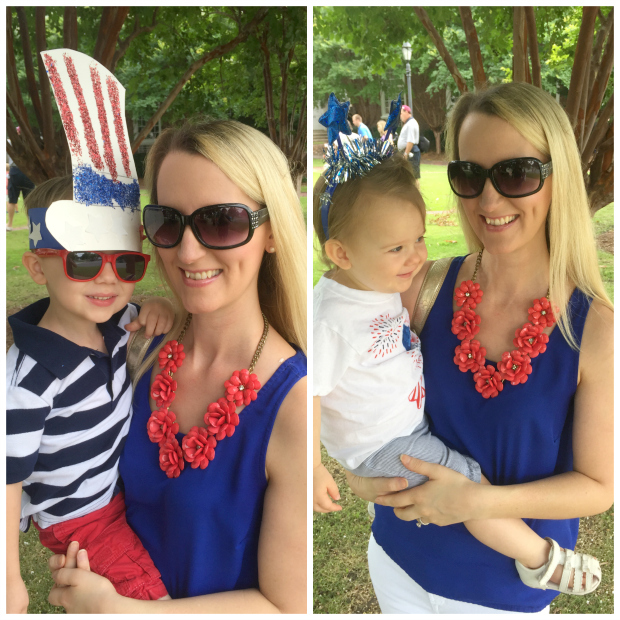 Lindsay's Sweet World: 4th of July Loooong Weekend! Happy Monday, y’all! We had a great long weekend celebrating this wonderful country with family and friends. This post could easily turn into a novel, but I’ll spare you too many details and just flood you with a bunch of pictures. Thursday was the kids’ God Bless America Parade at their school. They dressed up, paraded around, had push pops, and got to climb on the fire truck and police motorcycles. 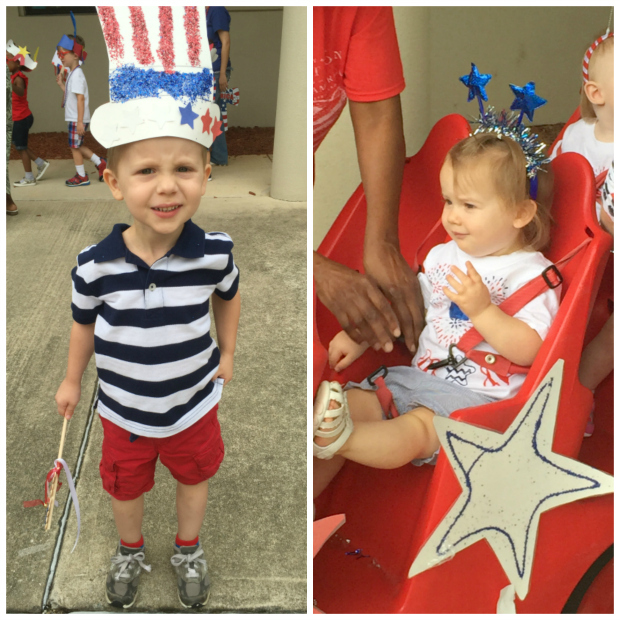 This was Jacob’s last parade because he will be transferring to his new school for Pre-K (4) in the fall. HOW?! Friday, Brian and I were off of work and we wanted to do something special for the kiddos, so we took them to Chuck E. Cheese’s for the first time ever. I was worried that there wouldn’t be much for them to do since they’re both so small, but there was a ton of stuff for smaller kids and they had a blast! We had pizza for lunch (which was actually very good), and then Jacob and Olivia rode almost every single ride and Jacob played a whole bunch of the games. He even ended up with 97 tickets and was able to pick out a little frisbee shooter, a plastic ring, and a tootsie roll to take home. 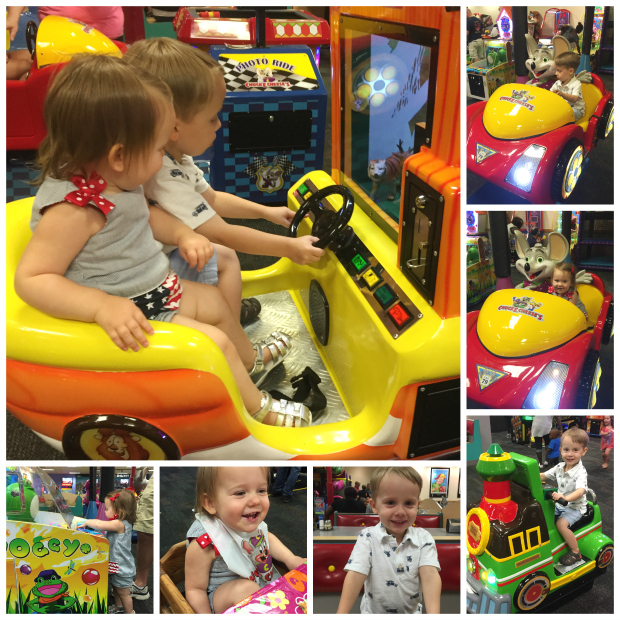 The overall Chuck E. Cheese’s experience was surprisingly not as annoying as we thought it would be. However, I can’t say the same for the ceaseless frisbee shooting that has occurred all over the house/car/back yard since then. Friday afternoon Jacob and I made firework art for the 4th of July, and it turned out so cute! All you need is paint, plastic forks, paper, glue, and glitter and you can make your own! I think I’m going to frame these and use them for décor next year! Our festive 4th of July Eve dinner! Saturday morning Jacob and I made some red, white, and blue homemade waffles for breakfast, and they were a hit! He and Olivia both scarfed them down! After breakfast I made the red, white, and blue white chocolate covered strawberries that I posted about on Thursday. They turned out so pretty, and they were absolutely divine. Every single one was gone by the end of the night. While making the strawberries, I also decided to put my own spin on a few of them, and they turned out great as well! I’ll be posting the recipe later this week, so please check back if you’re interested. I’m sure you can figure out how to make them yourself just by looking at the picture because they were easy-peasy! Saturday afternoon we headed over to my aunt and uncle’s house for some 4th of July festivities and a great time was had by all! We grilled, we swam, we drank, we ate, we did fireworks. The kids ran all around the back yard – Jacob played football, got muddy, and ran around in his underwear for the rest of the night, and Olivia got her dress soaked in the pool, so she ran around in her diaper for the rest of the night. Luckily, this smart momma had a couple of pictures taken right when we arrived, so we got a few family pictures in before all of the festive attire came off! Just as it was about time to go downtown to watch our city’s fireworks, a huge storm blew in, so we all just stayed put and did karaoke and danced instead, and I also put the finishing touches on a cute painting that my cousin Shelby did for her new dorm at UGA. I was disappointed for Jacob that he didn’t get to see the big fireworks this year, but the evening was still so much fun without them! Sunday, both kids slept late from being up way past their bedtimes the night before, so we took it easy and snuggled on the couch to watch Toy Story before going to Brian’s mom and stepdad’s house for lunch. We rounded out the weekend with dinner at my parents’ house, and then Sunday night we had to put up with more firework noise since Saturday evening had gotten rained out. I’ve been a sleepy lady today. I hope you all enjoyed your holidays as we did! I’ll be back later this week with my festive strawberry recipe, as well as a new DIY project for anyone who doesn’t know what to do with their old CDs that they just can’t part with! And for now, I'll leave you with some 4th of July fashion inspiration for next year! omg LOVE the red, white and blue foods! So clever! The outfit choices are on point too! Love the pictures! It looks like you had a great 4th of July weekend! Thank you! We did! It was wonderful!